One day, about a month ago, I took a walk along the paths which follow the creek in Bowmanville. On the way back, I crossed the paved walkway to take a lesser-known footpath which cuts through a wooded area. This tree stump sits close to where this trail begins. The colourful vegetation growing from the upper portion of its surface caught my eye. I decided to take a closer look. The late afternoon sunlight was streaming across it from behind, creating a sort of back-lit effect. I was glad I had the macro lens with me. 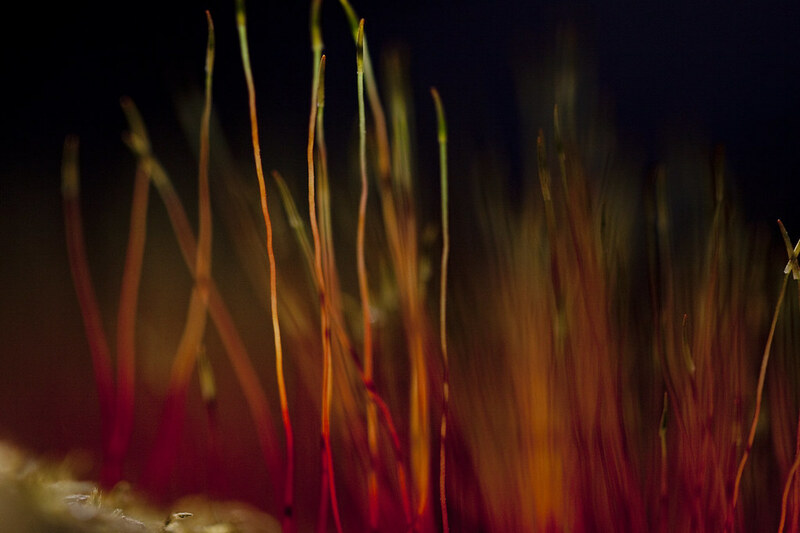 With the warmth of the sunlight behind it, this seemingly tiny piece of plant life appeared larger than life to my camera. Individual shoots of crimson, emerald and gold rise upwards to find the sun. Beneath the surface of the swaying stems, more life is forming, growing and evolving. I sat there for about a half hour, snapping image after image in this vibrant, neon world. I'm looking forward to seeing how it's looking one month later. I might just never leave that beautiful old tree stump next time. Thanks for indulging me. I'll have more photos in a few days. I wonder if fairies really exist and whether their world is something similar to this. Beautiful colors and signs of growth and rejuvenation. I always enjoy your pictures. Lucky for us, you travelled down a different path. It must be nice to have your son home, even if it's short visit. these reminded me of the delicate corals in the ocean. such beautiful colours. Some beautiful macros... See you around soon. oh wow i love the little neon world that you found hilary! What a beautiful macrocosmic world. Enjoy your time with your son! WOW! Imagine what you and now I would have missed if you had not taken a second look at this. The beauty is in all those tiny details. Wow! Those macros are incredible. Oh Hilary. these are beautiful. 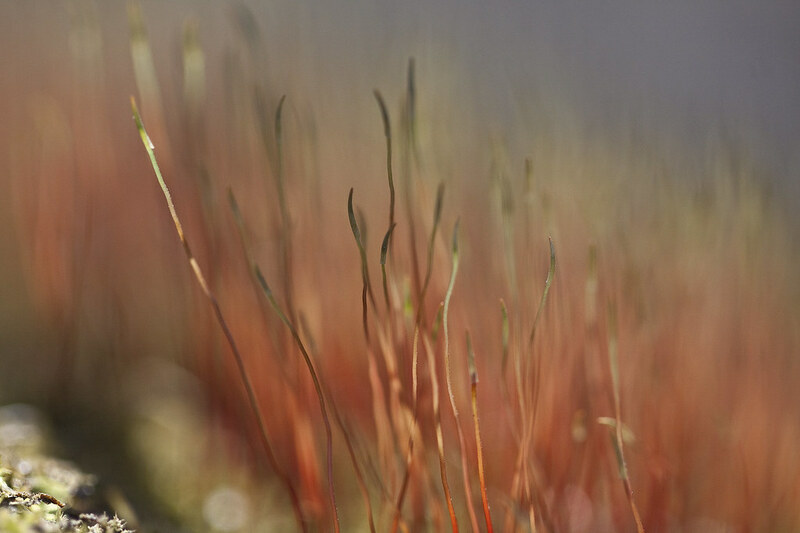 I love mosses. there is so much we cannot see without the help of a magnifying lens. i loved this! an entire world of wonder in the size of your palm. Not exactly sure why, but I had an urge to shave my legs after viewing this post. 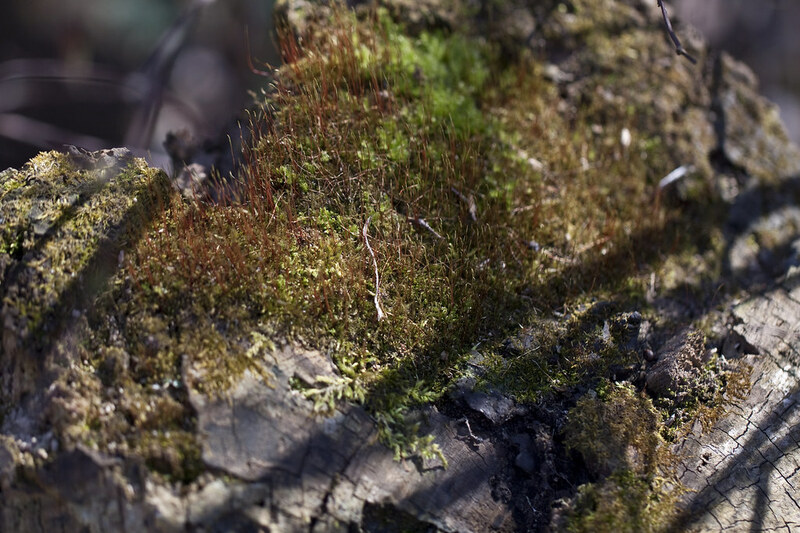 LOVE the images you took of the plant life growing on the old stump. Mother Nature sure is a beautiful thing. we share that kneeling down concentration that makes us blog sisters! lovely gems you took away. 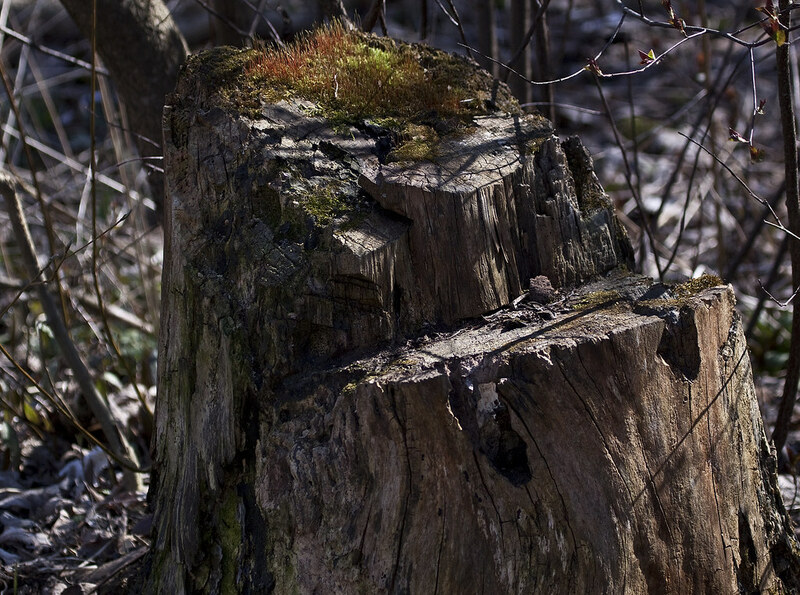 And if that stump isn't in colorful array you won't have to go too far to find one that's colorful. You did a lot of work on this one and it's well worth it. Thanks. Colouring is tremendous, and the tree stump is beautiful, magic Hilary. 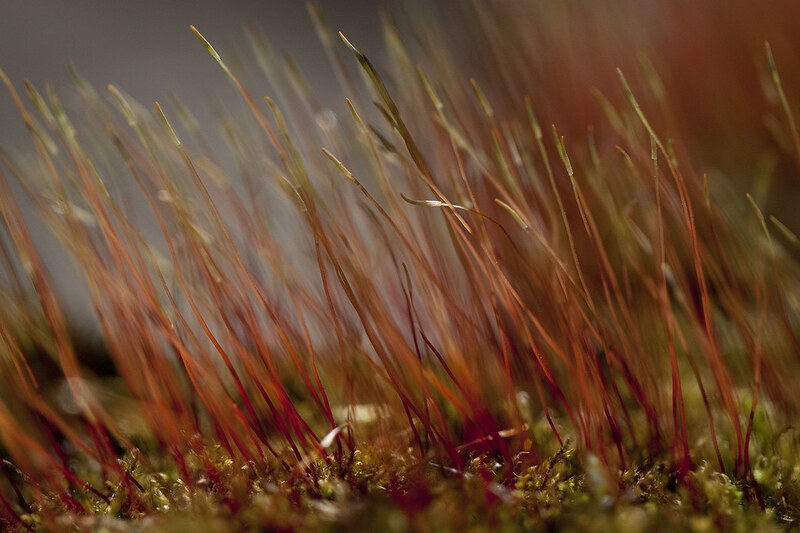 My photo mind has evolved into a macro, portrait image more often than not. I wish I could afford a true Macro lens but I have some diaopters which will have to serve the purpose. My all purpose zoom lens, does a fair job. Good work I would still be on the ground, if I dared to kneel. My prostheses knees would do that trick. The newer ones do, but I won't go through that again. So beautiful, I love how the warm grays surround the color in the 3rd shot. hoping mother's day was filled with love .. Happy Mother's Day to you too Hilary. I'm so glad you have some time with your son before he does his next stint. Absolutely adore these shots of the growth on the stump. Your macro looks into another world. Hello, Hilary. I'm in your blog the first time. You see so much more than I probably would while taking the same walk. Thanks for showing it to me. Those colors are so striking. It's amazing what you can see if you take the time to look. So glad you get to spend time with both of your boys for Mother's Day! 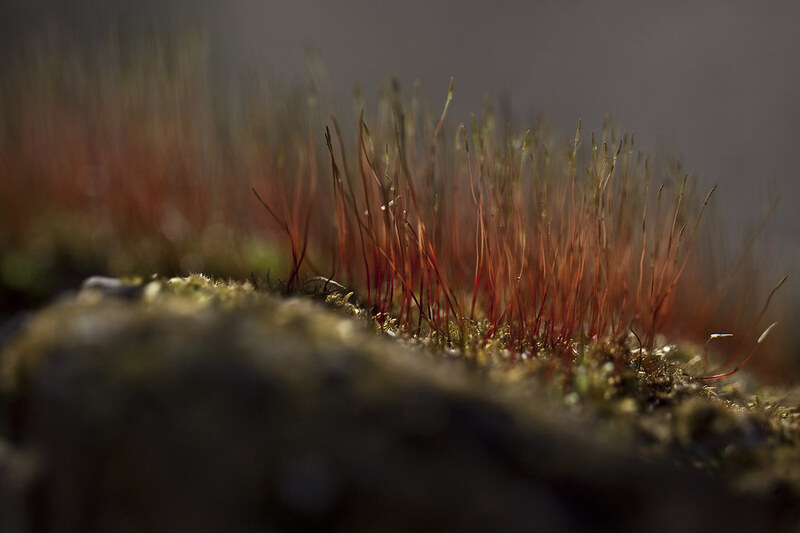 And I'm also glad that you took the time -- and your macro lens -- to photograph that mossy stump. It is a fascinating look into another world. I always love looking at the smallness of our world! Great photos Hilary! Thanks, everyone. I have been spending very little blogging time lately so I truly appreciate your visits and kind comments here, despite my sporadic appearances at your blogs. I hope to get back on track before TOO long, but can make no promises. Thanks always for stopping by. You folks are the best! I admire your skill at capturing these mini universes! It looks like I missed this one when you first posted it. I'm glad you shared the photo so I could enjoy the post! Wishing you a beautiful Sunday evening!